The Anglo-Irish Tradition by J.C.Beckett. Faber & Faber, London 1976. pp 158. This review was written on January 19th 2005. This book was recommended and lent to me by Frank Barrett. It is well written with good insights into the role of the Anglo-Irish and their origin as far back as the twelfth century. The Anglo-Irish were at their most powerful and most influential from the time of the Restoration towards the end of the seventeenth century until the Union in 1801. They were politically powerful with their own parliament during the eighteenth century but their political influence began to wane after the Union because of the transfer of the sphere of influence to Westminster and the gradual franchising of the Catholics leading up to and after Catholic Emancipation in 1829. The subsequent land acts of the late nineteenth and early twentieth centuries were to lead to their ultimate loss of political, social and economic influence. By the end of the nineteenth century 80% of the MPs attending Westminster were Catholics. Beckett emphasises throughout the book that the Protestant minority, although it had held full power in Ireland subject to the Crown, always felt threatened and vulnerable because of the great majority of Catholics in the country. This may be so and their vulnerability increased during the nineteenth and early twentieth centuries but this does not take from the fact that even as late as the first half of the twentieth century the protestant minority held a disproportionate amount of power and influence in the commercial, industrial and professional life of the country. It was only by the mid-century or later that the Protestants were no longer the privileged 10% of the population in terms of wealth and influence although they had lost their political influence entirely at the time of the Treaty with Great Britain. By the middle or end of the nineteenth century the Protestants, at least those in the South and in the West, no longer had political power nor had they any influence in the advance of nationalism. In the three southern and western. provinces it was the reform of the municipal corporations in 1840 which broke the protestant monopoly of power in the cities and boroughs, and which added to the effects of the Reform Act of 1832. Dealing with the landlords in the nineteenth century, Beckett comes out in their defence, calling in question the various allegations which have long been regarded as self-evident truths. He does not think rents were excessive; many landlords were in serious financial situations (almost certainly true); that evictions for non-payment of rent were rare and that most of the landlords’ problems were created by poor management by themselves and their agents, and of course their frequent absences in London. He compares the Irish situation with that of tenants in England and Scotland and does not think the Irish tenants were very much worse off. Beckett also thinks that much of the violence against the landlords was traditional and was inherent among the Irish tenantry since the eighteenth century; that it was partly based on a long folk memory. It is clear that the famine brought a new degree of bitterness between tenant and landlord. The landlord shared the blame with the government in Westminster for the disaster. The widespread disorders following the famine were fomented by the circumstances at the time, by the tradition of violence in rural Ireland and by the many secret societies which were the basis of many local conflicts. The tenants were also partly goaded by the home rule politicians who tended to magnify their grievances and who linked land tenure problems with that of Home Rule. To the Catholic majority, according to Beckett, the landlords were both a relic and symbol of conquest, confiscation and tyranny. The British Government by the nineteenth century came to regard the landlords as the principal barriers to a solution of the Irish question. He makes the important point that, largely because of the influence of O’Connell, it was the alliance between the Church and the Catholic population which laid down the lines which nationalism was to advance in Ireland. There is the important mention of Thomas Davis and his advocacy of a united nationalist movement which would be independent of religion. Davis strongly supported the establishment of the three Queen’s Colleges in the mid-nineteenth century but the idea of a university where Catholic and Protestant students could come together, free from denominational tension, was anathema to the Catholic Hierarchy. Our breed of Catholicism in Ireland has much to condemn it for the political disasters which marred the subsequent one hundred years in the country. Davis’s ideals suffered, not only because of the intervention of the Roman Catholic bishops, but also because of the fears and insecurity of the Protestant minority. Davis is remembered mainly, not for what he achieved, but for what he advocated, that is, a truly non-sectarian Irish nationalism transcending religion, class and ancestry. Beckett refers to the major role the Anglo-Irish played in the eighteenth and particularly in the nineteenth century in stimulating an interest in archaeology, antiquities and literature. This was an area which was free from the divisiveness of religion and politics, but the author does make the point that these protestant interests lead ultimately to the new spirit of a Gaelic Ireland, entirely separate from English culture, an Ireland with a rich folklore and mythology which was unique among Western European lands. It was seen as a golden age, a consciousness of which lead to a more extreme and more divisive nationalism. Thus the Anglo-Irish unwittingly contributed to their own downfall. The expanding ideal of a Gaelic Ireland was to breathe an attitude of even racial exclusion. 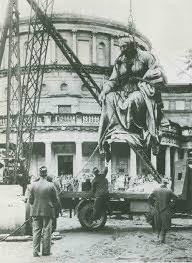 A further reverse for the Anglo-Irish during the nineteenth century was the disestablishment of the Irish Church in 1869, followed by the confiscation of almost all the Church’s property. Beckett appeared to me to be entirely objective about the role of the Anglo-Irish in the earlier part of the book but as we arrive towards the end of the nineteenth century he shows a definite sympathy for them and a bias which corresponds to their loss of power and privilege. 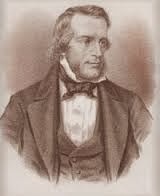 He states that the Home Rule movement had some initial support from the Anglo-Irish but this soon developed into bitter opposition because the Home Rule movement had accepted all the views of the Catholic bishops in relation to education and social legislation. He writes about the denominational policies required by the Church, meaning of course the Catholic Church. In Beckett’s long discussion about the attitude of the Anglo-Irish to the gradual empowerment of the Catholics, it is extraordinary how much the Protestants feared the consequences of such a political change. Was it that they expected the Catholics to treat them with the same contempt as they had treated the Catholics in the past and were they likely to exclude the Protestants from all political influence? 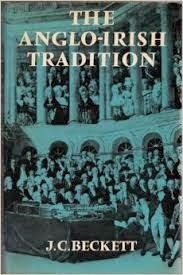 There is no doubt that the Anglo-Irish were justified in believing that they were going to lose their privileges and their financial dominance but they could hardly believe that the Catholics would treat them as badly as they had treated the Catholics in the past. Beckett finishes his sixth chapter with a more than gloomy note that the Anglo-Irish minority in the South of Ireland was deserted by both Britain and Ireland, and was treated with such little respect at the time of the Treaty. He quotes Garibaldi who said ‘They have made me a stranger in the land of my birth’. If the Anglo-Irish lost out as badly as they thought and as he suggests, it was as much their own fault as that of the Treaty plenipotentiaries and the Free State government. The Treaty plenipotentiaries took every measure to ensure the protection of the protestant minority in their agreement, including having their own state supported denominational schools. And De Valera consulted with representatives of the Protestant community before the plenipotentiaries left for London. To my knowledge no political or fiscal action was ever taken by subsequent Irish governments to reduce their privileges or affect their dominance of the commercial and professional world. In fact, Cosgrave appointed a disproportionate number of Protestants to the Senate when it was elected in 1923, some of whom gave loyal and valuable service to the country although they had no executive function. The Protestants were eventually disadvantaged by their own failure to take part in the day-to-day political activities of the new state, their isolation in their own schools and their close association with secondary schools in England. Their slow acceptance of a free Irish state, added to their educational isolation, must partly account for the halving of the minority population over the last eighty years. Things might have been different if in the early days they had looked to Ireland for their future, not to the island across the water. Yeats, speaking a few years after the setting up of the Irish Free State, protested that Protestants were just as Irish as Roman Catholics. According to Beckett, Yeats called on the Protestants to assert themselves in the life of the country. He said ‘Ireland is not more theirs than ours. We must glory in our difference, be proud of it as they are of theirs’. But sadly, with few exceptions, they did not respond to Yeats’s plea. Of course, the minority must have felt oppressed by the increasing influence of the Roman Catholic Church on the social life of Ireland and on the Free State Cabinet. They rightly must have resented the Hierarchy’s intervention on the issues of mixed marriages, divorce and non-denominational education. Their alienation must have been aggravated by the Irish language policies of successive governments and by the Civil War and its tragic consequences. Coming to the end of the book, his complaint about the fate of the Anglo-Irish in the new Irish Free State becomes more strident. Written in 1976, he attributes the decline in the Protestant numbers to their powerless state because of the policies of the Irish government. This view is hardly tenable in view of the fact they were allowed to retain all their possessions and wealth. They were free to take part in both local and national politics. However, with few exceptions, they could be seen to have deserted the corridors of political power and in the early years certainly they continued to look to England as their natural background and the English as part of their heritage. The last paragraph of the epilogue is about as patronising as one would expect from such a proud and arrogant minority.